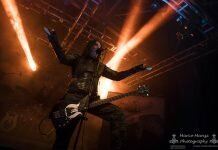 Amorphis presented their upcoming album, Queen of Time, to journalists at Sonic Pump Studios in Helsinki on February 24th, 2018. After the first round of listening, the band gave interviews, and we sat down with rhythm guitarist Tomi Koivusaari and the recently rejoined bassist Olli-Pekka “Oppu” Laine for a chat about the making of the new album, Oppu’s return, and the guys’ other musical endeavors. CORRECTION: Oppu Laine was referring to the permanent lineup of Barren Earth in his comment, not the original. The album is done and was just presented to outside ears for the first time. As the legendary sports question goes, how do you feel right now? Tomi: Well well… how would I put it? I’ve been inside this for so long that it feels like I know it inside-out. But it is always exciting when you realize that someone else will hear it and have an opinion on it as well. It is exciting! Oppu: Same here – in a way, after the session you want to get some distance from the material, so now it’s good to listen to this record with fresh ears and get a new perspective on it. It’s good for yourself too, when you have a good reason for listening. You worked with Jens Bogren for the second time. How did the process differ from Under the Red Cloud (2015)? Tomi: Not much, except this time we knew what we were going to do and knew Jens’s habits. The first time, some things came as a surprise – not in a negative way, but as a surprise nonetheless – that certain pace and precision. Now you knew exactly what you were going into, which on the other hand made it a bit more relaxed… or maybe even. But the structure was the same as previously: you’d go and work on things from dawn ’til dusk. I don’t know, maybe it was easier for Jens as well, knowing what we’re like as players, although the bassist had changed. It was a pretty easy process. Oppu: It’s a bit hard for me to say, for obvious reasons, but I was happy to notice that although it was a hectic session in a way… we had a week to record drums and you had to work all the time. Snoopy [Jan Rechberger, drums] had to play there all the time, and the others could of course go where they wanted when they had the chance. Then when it was time to play my own parts, I spent three days there in Örebro working on them. It truly was from dawn to dusk; in the best case you’d start at 7:30 in the morning and end sometime around 21:00. My fingers were practically bleeding, and I would play with the help of painkillers. I had little time, which got used pretty effectively. Oppu: Yes, but it was good that you could get everything done in such a short period. According to the press release, Jens had a strong vision for this album. Did this lead to any disagreements or did you trust his vision? Tomi: There weren’t really disagreements – I feel like maybe last time Jens had more ideas for changes in the songs. It may be that we took them into account beforehand in a way… maybe. Something like “Jens will suggest that this should be faster anyway” and so on. There were some parts that did change, and certain arrangement ideas were done over. Then we knew that he had some visions for choirs and this kind of stuff, but we didn’t really have anything to say about those, because we didn’t know what they would sound like until we heard them. I did accept them though. Oppu: Yeah, the songs were roughly in that form even before the sessions. Jens did put in a lot of work, but you shouldn’t think he did this all alone. [laughs] The songs and the arrangements were made by the band, and then we fixed them together with Jens. All these string arrangements and orchestrations are just spicing things up there. The songs can be executed even without them in a live situation. It doesn’t go into Nightwish territory. Tomi: Mainly the sounds we normally might’ve played – and in the rehearsals did play – on keyboards were replaced with real ones. Oppu: Yeah, that’s right. We’ve always had Human Voices [a keyboard patch -ed.] and strings in use since the 90s, but now they’re just actualized in a different way. While introducing the album, Jens also mentioned that not all the pieces were in place yet by the time you hit the studio. What kind of shape were the songs in at that point? Tomi: They were in the shape they usually are in. We came straight from the tour, so we had an intensive… I think we had a break of a week or two, and then we had a couple of weeks to check through the songs. We’d all heard them – we’d been exchanging demos, so little by little you’d managed to instill them in your head. I think it was maybe a couple of weeks before Jens came in – I’m not entirely sure. Oppu: We had the last gig of the tour on a Saturday, and on the following Monday we started rehearsing. Tomi: Right, it was like that – we didn’t have a break after all. Oppu: At least I was surprised at how elaborate and mature the demos were already. Those songs were pretty much ready when we started rehearsing them. We also made some changes before giving them to Jens. Nowadays it’s possible to demo songs pretty elaborately at home, so they were in a pretty good shape. Tomi: Yeah, they didn’t go through any major changes in the end. Of course the entity is always built from small details, so we did check those out, but they were basically such that had we rehearsed them for half a year, we would’ve had everything totally refined. Then Jens might’ve put the pieces in a new order, but now we kind of kept it as a sketch of sorts intentionally, so that in the studio we had time to refine it into the final form. Oppu, you’re a sort of expat who rejoined the band after years of absence. What does it feel like to have the original foursome back together again? Oppu: It does feel really good, there’s no denying it. It’s been fun and natural – right from the first show it felt like there was no forcing going on, although we played quite a lot of material that I hadn’t originally been involved in. But the band is the same and the guys are the same, so it’s natural that the material fits my playing pretty smoothly. It’s felt good and luckily I get to carry on. Hopefully for a long time! How much have you followed Amorphis over the years after your initial departure and have the newer songs become familiar to you? Oppu: I have followed them, and of course these songs that we’ve been playing at festivals and elsewhere have become familiar from the radio or somewhere. But I don’t really listen to any kind of metal or new music that much. I don’t really follow any bands, I just listen to jazz at home. [laughs] I haven’t listened to the records, but now I have discovered that it is pretty strong material, especially starting with Eclipse (2006). We’ve been playing stuff from then on, and I have liked it. Have you got any new favorites after playing them live? Oppu: Tough question, but I thought it was cool when at the very first shows we played Eclipse from start to finish. I think it’s a pretty strong entity, and it gave a good reason to delve into one full album. There are quite a few good songs, but then every record has its best moments. I don’t want to pick any individual songs, but there’s good material, and it’s been a pleasure to play it. Speaking of Eclipse, in the official Amorphis biography it was mentioned that you guys recorded demos of some of the songs that ended up on the album with Pasi Koskinen on vocals before he left the band. Can you remember which ones they were? Tomi: What was there? There was probably at least this… [laughs] I can’t remember the titles! What was the third song called again? Tomi: That’s the one! But they had different lyrics and totally different vocal ideas. It must’ve been that and… I don’t know, the brains filter out all the unessential information! [laughs] I can’t remember – we had tried out some songs, but we hadn’t gotten far into that process. Actually I don’t know if we even demoed them with Pasi – we may have mainly demoed those songs as songs that we would’ve started to look into next with Pasi, but then he left. We had songs ready, but I can’t remember if Pasi did any vocals. We didn’t get to see the credits yet, so how much did you contribute to the writing of the new album? Oppu: I did bring in material, but it was still in such a sketchy state that there was really no point in working on it that much. So none made it in yet? Oppu: Well, there’s one as a bonus track, but it’s like that for a reason. It may not have fit into that entity. I think this is a strong package now – we made the right song choices. But everyone does have the chance to bring in material. The album tracks were written by Esa [Holopainen, guitar] and Sande [Santeri Kallio, keyboards]. Tomi: Yeah, I didn’t get anything done this time either. Due to the situation in my personal life, it didn’t take off – no ideas came. Maybe again on the next record then… but it’s good that we’ve almost got too many songs, so it doesn’t matter even if you can’t always contribute. And you’ve got a dozen records behind you as well. Tomi: Well yeah, that too. Since there are so many string and choir parts on the album, has the idea of an orchestral show been brought up yet? Tomi: Sande can play some of those, so we can still perform a gig without anything, with the band only. But we have to think about it once we start looking at the songs. It would be pretty sweet to get some of the things in if they were played back as samples. Oppu: It’s going to be a lot of work to make live arrangements when the gigs start. It remains to be seen what can be done. There are certainly some songs that we won’t be able to play live. Tomi: Right… I believe they may all be playable, but then we can use… we never use backing tracks of the instruments we play ourselves, like having drums on there or something. It’s mainly for the special stuff. If there are female vocals, it’d be pretty crude if they got totally left out if you want to play that song. I think it was track #4 (“The Golden Elk”) that included a solo played on an exotic string instrument. What is it called? Oppu: Like this nylon string-like or -sounding thing. Some Croatian… or was it Greek? Tomi: Oh well, it is some sort of string instrument. Oppu: Somewhere from around Balkan anyway. Jens knew a musician who made an arrangement… or basically played a solo. How is it going with Barren Earth? You have a new album (A Complex of Cages) coming out, but I assume you won’t have a lot of time for gigs, with the Amorphis album cycle starting soon. Oppu: Well yeah, that is true. We’ll see when it’s a bit quieter on this front. Now we’re going to play two shows in Finland, and that’s it for now. As a lineup, it’s been difficult from the start – we’ve used substitutes, but now we have the sort of mentality in the band that we’d like to play with the album lineup, if we do play, which naturally makes things even more difficult. [laughs] But maybe it’s a supportable idea in itself. Then when the right moment arrives, I’m sure we’ll become active on the gig front. What about Abhorrence? I’ve heard you guys have something new in the works as well. Tomi: Yeah, we’re supposed to record an EP. We got over the threshold and [wrote] the first new songs in 27 years. You kind of had to get yourself in the mental state you were in as a 15-year-old. [laughs] But when we made it, it was surprisingly easy, or if not easy, then at least fun. At the moment we have two fully complete songs, and a lyrical concept actually exists for the next album already, but that’s going to be a bigger step. We decided that it’s good to start with this kind of EP. Tomi: Yeah, and we can continue later if we’ve got time. The idea is that it’s supposed to be fun. Of course you don’t want to release anything lukewarm so that you can stand behind it. At least to us it’s a hell of a lot of fun to do some chainsawing after a long break. Is it like a return to teenage years? Tomi: [laughs] Maybe there’s more of a class reunion feeling, as you’re messing around with your childhood friends. The others don’t do this for a living, so I guess getting to play once in a while means a lot to them as well. Maybe nowadays old geezers’ jamming consists of death metal and blastbeats, while in the past it used to be some kind of blues jamming. You go chainsawing at the rehearsal room. [laughs] But we’ll see, yeah – we’ve got one gig coming up and we’ll play gigs sometime in the future if we feel like it. There are no bigger plans. The last time, we interviewed Esa before the Juhlaviikot show. How did the Huvila gig go for you? Tomi: It left a good feeling – it was very successful. It was an exciting place, because of course it’s a hometown event where you’d seen all kinds of spectacles before. But the atmosphere there was really good and I feel like we nailed it. Hopefully some day we’ll get to do something like that again. It was exactly the fact that it was something special that made it fun, having the show in two parts including acoustic stuff, guests, and other kinds of things we normally wouldn’t do. It was certainly special from a viewer’s perspective as well! 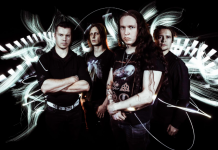 Now, Niclas [Etelävuori, bass] left the band a year ago and he’s got a new band called Flat Earth. Has he played any of their stuff to you guys yet? Tomi: I guess he has played to some of us – I think our drummer Snoopy recorded their first demo. I haven’t bumped into him, but I don’t think we would’ve been ringing each other anyway. But I don’t see any problem – it would be nice to see him at some point and hear this band too. Okay, our slot is coming to a close, so thanks for your time!